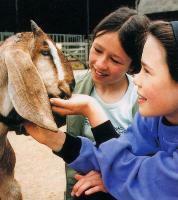 Wimpole Home Farm, part of the Wimpole Estate, is still a working farm and is East Anglia's largest rare breeds centre having rare breeds of goats, pigs, horses, cows and poultry. With its history as a model farm, its many rare breeds of farm animal and adventure playgrounds, it has something for adults and children alike. There are mini pedal tractors for children to ride on. 8ml SW of Cambridge (A603), 6ml N of Royston (A1198). M11 Junction 12. 30 mins from A1(M).